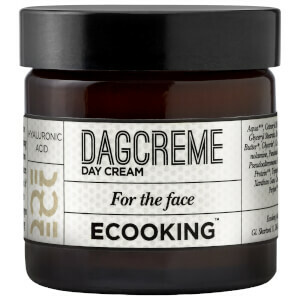 Reveal younger-looking skin with Ecooking Day Cream, a silky moisturiser that works to tone and firm the facial contours. Powered by Hyadisine, which mimics Hyaluronic Acid to deliver instant and lasting hydration to skin, the cream helps to plump out fine lines and wrinkles and infuse the complexion with a natural glow. Trylagen supports the production of collagen and elastin to improve elasticity and create a smoother, brighter and more youthful visage. Apply the day cream onto your face, neck and décolleté. Aqua, Caprylic/Capric Triglycerides, Acetyl Hexapeptide-8, Caprylyl Glycol, Cetearyl Alcohol, Glyceryl Stearate Citrate, Glyceryl Caprylate, Glyceryl Stearate Citrate, Glyceryl Caprylate, Hydrolyzed Wheat Protein, Hydrolyzed Soy Protein, Trip eptide-10 Citrulline, Tripeptide-1, Lecithin, Butylene Glycol, Xanthan Gum, Carbomer, Triethanolamine, Pheno-xyethanol, Butyrospermum Parkii Butter**, Sodium Levulinate, Potassium Sorbate, Tocopherol, Helianthus Annuus Seed Oil**, Retinyl Palmitat, Sodium Hydroxide, Parfum, Geraniol, Limonen/d-Limonene, Linalool.